If the history of Lenna of Hobart, a beautiful heritage hotel in Battery Point has fueled intrigue, head for one of Tasmania’s earliest settlements. Richmond is a 30 minute drive east of the hotel’s front door, an early colonial village with broad nineteenth century streets. Roll over the Richmond Bridge, built by convict hand back in the 1820’s. The grassy slopes leading down to the Coal River nearby, are made for a picnic blanket. They come complete with a welcome party of resident ducks. The former convict station and military post boasts more than 50 Georgian buildings, and is best explored on foot. Richmond’s wide main street is dotted with galleries, cafes, restaurants and antique stores, many of which hold their early-Tasmania charm. The work of ceramicists, wood turners, glass blowers and painters offer a treasure-like discovery of the township. Lunch options range from a famed pie from the bakery (go the scallop pie! ), to a casual pub meal or a more refined affair complete with Pinot from the Coal River Valley. On a nice day beneath an umbrella, others opt for bubbles and soft cheeses made just up the road. Although pretty as a picture, the township has its share of darker stories. Gaoler George Grover’s ghost is said to hover about the bridge, where he was murdered by convicts tiresome of his floggings. Richmond’s early tales are plentiful on a visit to Richmond Gaol. At the gaol (open from 9am-5pm), get a sense of the hardship by stepping into a solitary confinement cell. There’s not much wriggle room at one metre by two metres, indicative of the grim conditions endured. The flogging yard and sleeping quarters of the chain gain can also be explored. Venture off the main street to discover more. 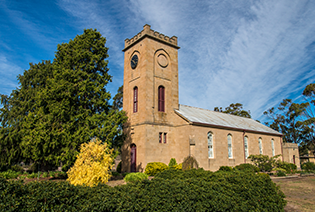 Up past the bridge is St. John’s, the oldest Australian Catholic Church still in use, dating back to 1836. Not far from Richmond other highlights include Bonorong Wildlife Sanctuary, well worth a visit for those keen to see our Tasmanian devils and other native locals. The sanctuary also run night tours, a thrilling way to cap off your Coal Valley experience. Don’t leave town though, without a pocket full of lollies. Sweets and Treats is Richmond’s much loved lolly shop. The sweet delights hail from the far corners of England to locally handmade treats. Why not get your fix with a bag of esmeraldas. Haven’t heard of them? That’s because they’re a Tasmanian original. After that it is just a short drive back to your Salamanca accommodation, Lenna of Hobart, one of the leading hotels in Hobart.